But when we pulled up the chart, the whole thing appeared to be too weird to be true. And it wasn’t true. Klobuchar was the top prosecutor for Hennepin County, the state’s largest, from Jan. 3, 1999, to Jan. 3, 2007, until she was elected to the Senate. The county includes Minneapolis, so about 1 in 5 people in Minnesota live there. So, how was that possible? Experts told us a 65 percent drop would be pretty impressive over seven years, but this was a 65 percent drop in a year — with no real improvement after that. We also noticed that the drop in Hennepin County was mirrored by statewide figures. So did that mean that it was a statewide phenomenon — or that the county was the main cause of the overall result? Our Fact Checker nose smelled a statistical anomaly. Indeed, when we moved away from rates and looked just at raw numbers, we saw that the jail population did not change much from 2000 to 2001. The Vera website also breaks down the data according to white, African American, Latino, Asian and Native American. But whereas the five racial categories added up to 84 percent of the total jail population in 2000, they added up to just 46 percent of the population in 2001. That was primarily because the number of African Americans in the jail dropped by 380 people, or 63 percent. The number of white people also fell significantly: 170, or 39 percent. So we contacted Vera, and the staff there helped us figure out what happened. “This situation means that no meaningful statements about the number of black people in jail in Hennepin County can be made for the time Klobuchar was DA,” he added. Of course, we’ve been focusing on the trend in jail incarceration. The decline in the prison incarceration for African Americans, as we noted, was much lower. Jasmine Heiss, a spokeswoman for Vera, said the best measure of the impact of policy and practice changes on prison populations is the rate of admissions. “Prison populations change slowly after a state implements all but the most drastic reforms, as most people are serving multiyear sentences,” she said. In 1999, the overall rate of prison admissions from Hennepin County to the state prison system was 168 people per 100,000 residents between the ages of 15 and 64. In 2006, Klobuchar’s last full year in office, the overall rate of prison admissions was 169 people between the ages of 15 and 64. “The impact of prison incarceration on the county, therefore, remained virtually unchanged during Sen. Klobuchar’s time in the county attorney’s office,” Heiss said. Still, between 1999 and 2006, the rate at which African Americans were admitted to the state prison system from Hennepin County decreased approximately 28 percent. But, she noted, African American prison admission rates were still 22 times higher than white prison admission rates in 2006. While Klobuchar relied on publicly available data from a credible source, we believe it should have been apparent to her that something was wrong with it. She claimed that the drop took place “from the beginning of my term to the end.” In reality, much of the drop took place in just one year — a year that should have been memorable to a prosecutor if such a change in the incarceration rate of African Americans actually had taken place. The prison admission rate for African Americans did drop during her tenure, though how much credit she can claim is subject to dispute. (The population in jails is more closely associated with the policies of the local law enforcement.) The racial disparities remained huge. 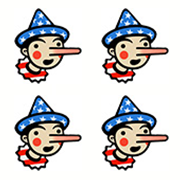 We wavered between Three and Four Pinocchios but ultimately tipped toward Four. On national television, Klobuchar claimed a figure that should have been unbelievable to herself. in an interview on CNN's "State of the Union"